We've previously mentioned the increasing focus on the real short-term interest rate as an important measure of the Fed’s policy stance. In truth, we wish the Fed had paid more attention to this measure during this cycle because no other measure (other than perhaps the Fed’s balance sheet) shows how inappropriately-loose monetary policy remained in the face of a steady economic expansion. As for the view that policy won’t be restrictive until short rates are lifted above the inflation rate, there’s no guarantee the Fed will be able to pull that off—even if it wanted to. There’s a strong historical relationship between real short-term rates and the federal budget balance as a percentage of GDP. Large budget shortfalls like the current one are usually accompanied by negative real rates. We can’t say whether it has been an intentional decision by the Fed to finance fiscal irresponsibility, or whether both variables are determined by cyclical conditions. 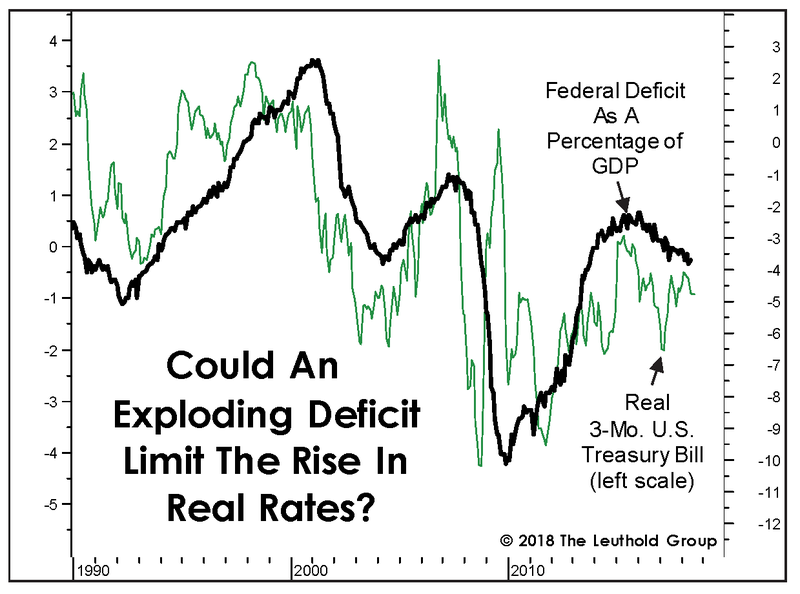 But deficits are steadily growing in relation to GDP, which could limit any rise in real rates.